BANGOR, MAINE -- 10/08/2016 - Husson's Anthony Brunelle (right) breaks up a pass intended to Gallaudet's Spencer Maples during their football game at the Winkin Sports Complex in Bangor Saturday. BANGOR, MAINE -- 10/08/2016 - Husson's John Smith (left) looks to run up field past Gallaudet during their football game at the Winkin Sports Complex in Bangor Saturday. BANGOR, MAINE -- 10/08/2016 - Husson's Kyle Gaudet (left) is tackled by Gallaudet's Louie Akuffo during their football game at the Winkin Sports Complex in Bangor Saturday. BANGOR, MAINE -- 10/08/2016 - Husson's John Smith (center) tries to break free from a tackle by Gallaudet's Carneilus Smith (left) and Jamie Cumberbatch during their football game at the Winkin Sports Complex in Bangor Saturday. BANGOR, MAINE -- 10/08/2016 - Husson's John Smith (left) tries to break free from a tackle by Gallaudet's Jamie Cumberbatch during their football game at the Winkin Sports Complex in Bangor Saturday. BANGOR, MAINE -- 10/08/2016 - Gallaudet's Spencer Maples (center) is tackled by Husson's Ellis Throckmorton (left) and Anthony Brunelle during their football game at the Winkin Sports Complex in Bangor Saturday. 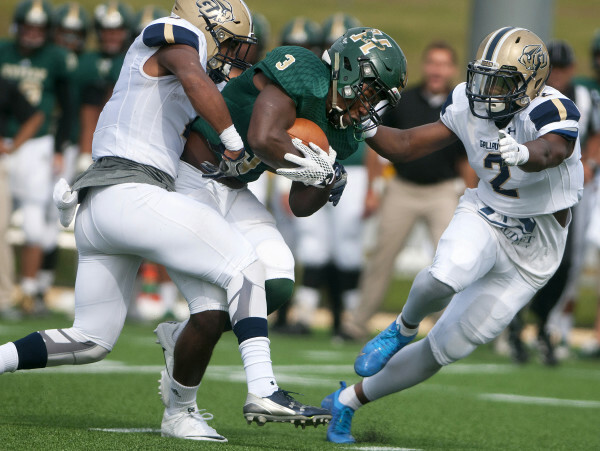 BANGOR, MAINE -- 10/08/2016 - Husson's Robenson Saintard (center) fits for yardage against Gallaudet during their football game at the Winkin Sports Complex in Bangor Saturday. BANGOR, MAINE -- 10/08/2016 - Husson's DJ Allen (center) pushes for yardage against Gallaudet during their football game at the Winkin Sports Complex in Bangor Saturday. 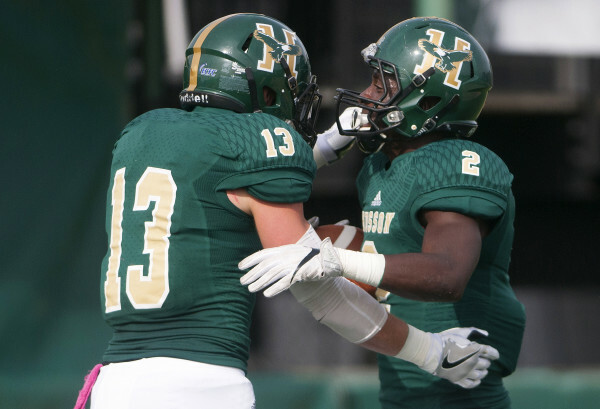 BANGOR, MAINE -- 10/08/2016 - Husson's Robenson Saintard (right) celebrates with teammate Kyle Gaudet after scoring a touchdown against Gallaudet during their football game at the Winkin Sports Complex in Bangor Saturday. 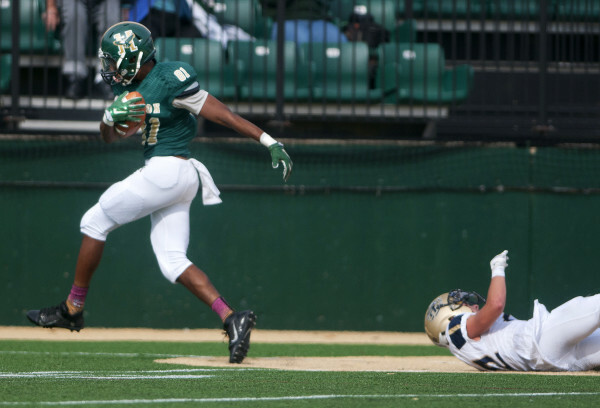 BANGOR, MAINE -- 10/08/2016 - Husson's Kadeem Edge (left) outruns a tackle attempt from Gallaudet to score a touchdown during their football game at the Winkin Sports Complex in Bangor Saturday. 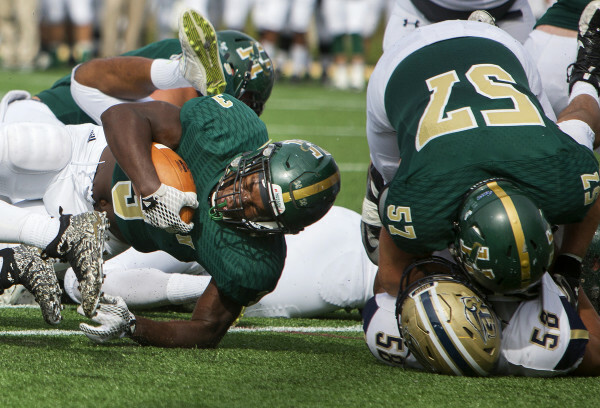 BANGOR, MAINE -- 10/08/2016 - Husson's John Smith (right) dives into the end zone past Gallaudet for a touchdown during their football game at the Winkin Sports Complex in Bangor Saturday. 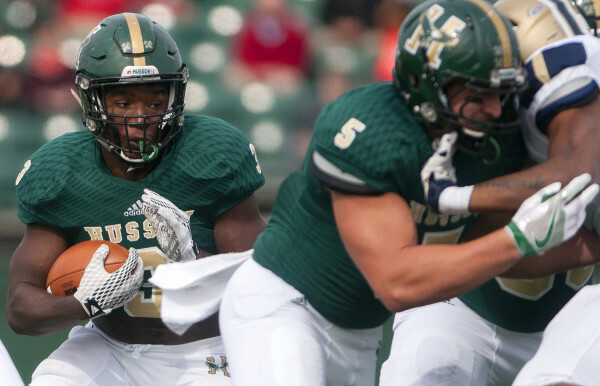 The Husson University football team cruised to its fourth victory of the season on Saturday afternoon, defeating Gallaudet University of Washington D.C., 50-16. Coach Gabby Price’s club (4-1) was able to take care of business in spite of standout junior tailback John Smith leaving the game with an ankle injury in the second quarter. Smith did have 52 yards on 11 carries and a touchdown before exiting. 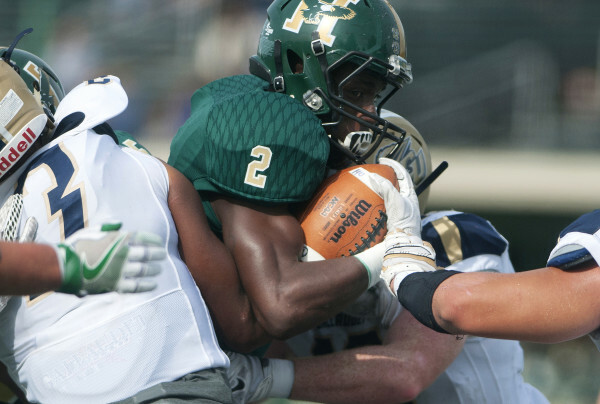 Husson built a whopping 43-8 halftime lead, scoring 29 unanswered points after Gallaudet’s Carnelius Smith had returned an interception 98 yards for a touchdown on the opening play of the second quarter. Touchdown runs by John Smith and Obie Christmas had given Husson a 14-0 lead. Carnelius Smith’s interception return came after the Bison had fumbled a punt at the 1-yard line, which Husson recovered. Eagles’ quarterback Cory Brandon settled in after that, following the interception with three second-quarter touchdown passes, two of which went to Robenson Saintard, covering 48 and 14 yards. Brandon also found Kadeem Edge on a 44-yard score. 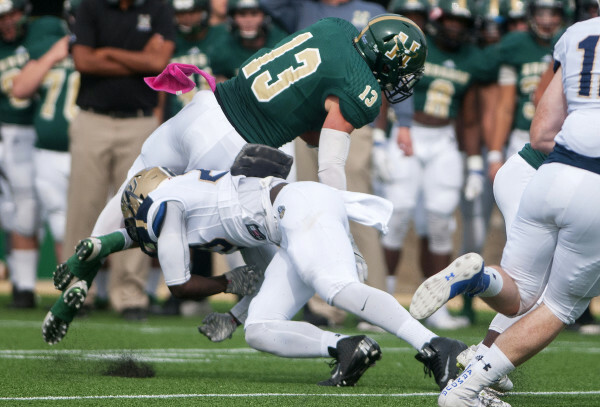 Husson’s defense also contributed to the scoring surge, with Jean Gabriel returning an interception 21 yards for a touchdown. 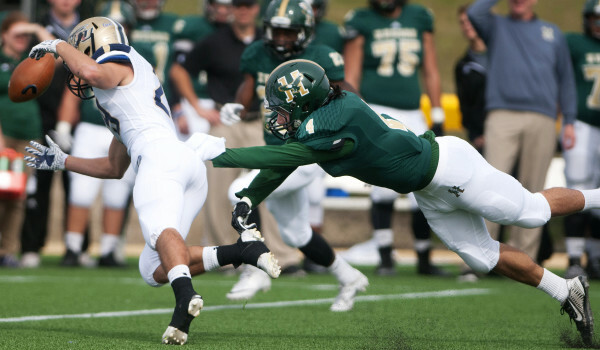 The Eagles would limit Gallaudet (1-4) to two first downs and 14 yards of total offense in the first 30 minutes. Husson also forced four fumbles and recovered one. 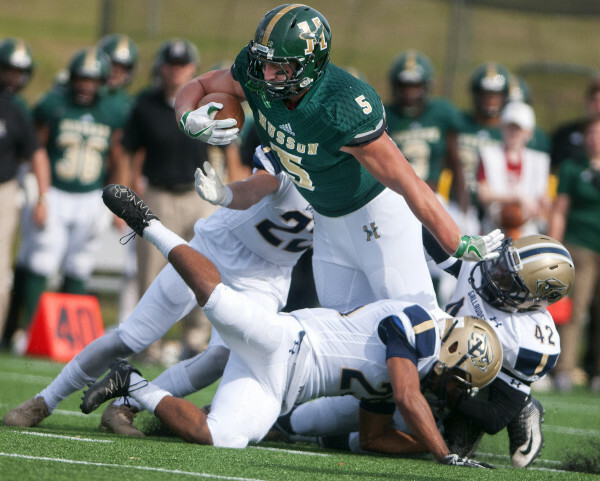 Christmas added his second touchdown of the contest early in the third quarter before Husson emptied its bench. He finished his day with 45 yards on 14 carries. Brandon finished the day 11-for-17 passing with 210 yards and his three TDs. Edge had 88 yards and a touchdown on just three receptions. Gallaudet finally got an offensive touchdown late in the third quarter on a 91-yard pass from Antoine McKinney to Lawrence Watson. Chuck Browne was Husson’s leading rusher with 74 yards on 12 carries. 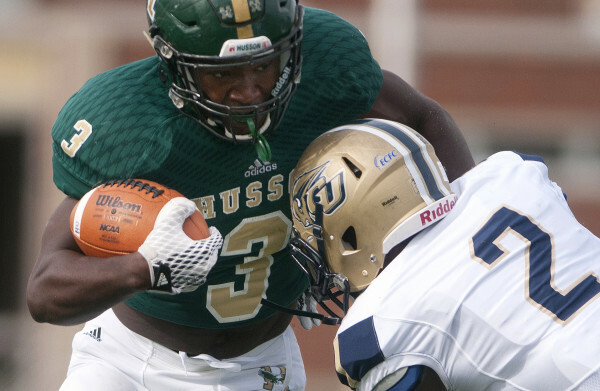 Husson rushed for 263 yards as a unit. 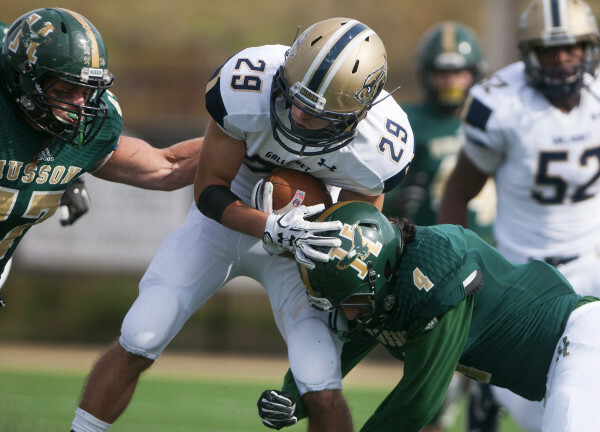 Gallaudet finished the game with 117 yards of total offense.